26 September: Seeing ghosts to order? I felt annoyed! I looked out of a window and saw that someone had dropped a plastic box in the street. But as I looked a little harder the plastic box vanished before my eyes. There are, of course, ghosts of humans and animals but ghostly objects are much rarer. But they do occur occasionally. However, this clear plastic box looked like the sort of thing some food, like salads, comes in from a supermarket. It looked like litter rather than any ghostly manifestation. 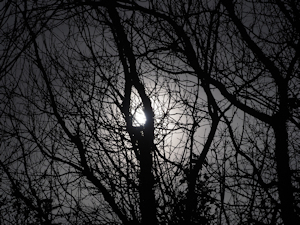 It was, of course, a misperception, the same phenomenon responsible for many sightings of ghostly human figures. What makes this sighting interesting was that I was able to make it reappear easily. Normally a misperception 'breaks', so you see what's really there, and the misperception never reappears. But this one did. Through slowly changing my angle of view I could sometimes see the 'plastic box' and sometimes not. It was completely predictable and controllable. It turns out that the 'plastic box' was made from a particular accidental visual alignment of three things. The top of the 'box' was formed by a drain cover in the pavement. The body of the 'box' was formed by the reflection of a white curtain fold in the window I was looking through. Finally, the base of the 'box' was formed by a patch of lichen on the pavement. If I moved just slightly, so that the three things no longer exactly aligned, the 'box' vanished instantly. But, unusually, it returned if I moved back. The box didn't reappear instantly, it came back after a few seconds of looking. As a final experiment I revisited the scene at a different time of day. I could no longer see the 'box' no matter where I stood. I could still see the drain cover, lichen and reflected curtain fold, but the box would not appear. Clearly lighting was also a crucial factor. Specifically, I think the drain cover only worked as a box top when it was strongly illuminated from above by the sun, looking almost white as a result. This raises the interesting possibility that it might be possible to measure misperception. By that I mean one could measure the size of an area where a misperception could be seen. The lighting could also be measured to see within what parameters a misperception appears. In this way it might be possible to get misperceptions at a particular location, and hence ghosts, to appear more or less to order. Not everyone will see the misperceptions but those that do will see them consistently. 20 September: Paper defies gravity, again! When truly strange things happen twice you begin to wonder! I saw something odd lying beneath a letter box recently. It resembled a dark toothbrush. I did not have my glasses on so it was heavily out of focus which is probably why I thought of a toothbrush. I could not think of any good reason why a toothbrush would be in such a place. Closer inspection revealed something much stranger. It was a piece of A5 paper standing on its edge! It was like the photo (right)* but mostly black, shiny and with printing on it. The paper had clearly come through the letter box. I was alone in the building and the paper had not been there the last time I looked. It was a commercial flyer. It was entirely unremarkable apart from the fact that it was standing, improbably, on its edge. The letter box was about 1m above the floor and the paper maybe 20cm horizontally away from it. I was able to topple the paper by blowing gently from a distance of over a metre away. So it was clearly very finely balanced. It have tried to persuade bits of paper to stand on their edge like this but without success so far. I have discovered it is not that unusual for the paper to land on its side. However, momentum from the fall usually then causes it to fall flat. To stay upright on its edge the paper needs to land in such a way that there are no horizontal forces. The chances of this happening by chance are probably hugely against but it happened. I had a similar incident to this some years ago (see here). In that case a dropped piece of paper stood on its edge for a whole second. In this latest incident the paper remained upright indefinitely, until I blew it. How is that possible? One thing I noted about this latest bit of paper is that it was slightly wrinkled, rather than completely flat. I think these slight wobbles in the edge of the paper were acting as additional points of support. Even so, I tried to do this experimentally and was not able to produce just the right pattern of wrinkles to keep a bit of paper upright indefinitely. I think heavy paper will work better and it would be easier to do with card. The actual paper involved was heavier and stiffer than typical photocopy paper but not by much. 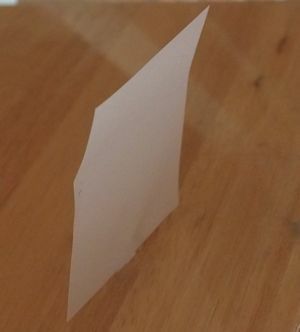 So this paper standing on its edge required both a particular way of landing, to avoid tipping over, and just the right pattern of wrinkles to remain upright. My previous experience showed me that this kind of thing can happen by coincidence even though I have not, so far, been able to reproduce it. The point is that extraordinary things sometimes happen simply by chance, with no need to consider the paranormal. I can see how some people might think it a paranormal event if they witnessed it. *The photo is merely an illustration. It was digitally manipulated to remove the support used! As a birder I'm occasionally asked by people to identify a 'strange bird' they've seen. They've never seen anything like it before and wonder if it might be rare. And here's the odd thing; it is almost always a Jay. Why? The thing about Jays is that they are big, colourful, loud and hard to miss. Well they're hard to miss if you see one but they are also very secretive and rarely come out into the open. So when a non-birder sees one they think it must be rare because how else can they explain never have seen such an unmissable bird before. 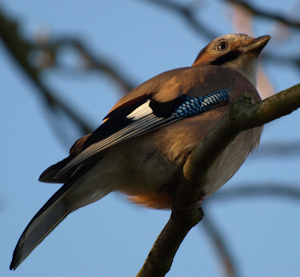 In fact, Jays are relatively common in Britain. Seeing an animal you've never noticed before could, of course, lead to its being reported as a cryptid. While that's unlikely to happen for Jays, there are rarer animals in the UK that could be misreported as something truly strange. The broader point here is that none of us are experts in everything we might happen to see when going about our everyday lives. While the vast majority of stuff we see will be familiar there will always be a few things that are not. And these few things that can give rise to xenonormal reports. The xenonormal is something which is unfamiliar (to the observer), but normal, that is taken to be anomalous or paranormal. I mention all this because I happened to see a Jay yesterday, the first in a while, and it reminded me that this is the time of year when you are most likely to see one. They are easier to see in the autumn because they are busy finding acorns, hazelnuts and other food to bury for winter provisions. 12 September: Opening the door to precognition? Has my acquaintance (MA) who gets microsleep with REM (MWR) experienced a genuine case of precognition? MA was in a MWR when the startling incident occurred. It was a 'being somewhere else' type MWR where none of the real surroundings were visible. In the MWR, MA saw a door closing. It was so close that it actually hit MA on the arm. This caused MA to wake from the microsleep. It then emerged that MA really had bit touched by someone's hand causing the awakening! But this is where it gets truly weird! It is well known that real life sensations, like the sound of an alarm clock going off, can get incorporated into dreams. So there's nothing mysterious about feeling a touch while dreaming. But in MA's MWR the door was observed closing before it 'hit' MA, which is when it was felt. In other words, MA somehow anticipated being touched before it actually happened despite seeing none of the real scene. Is it precognition or could there be another explanation? Could MA have heard the approaching hand? It seems unlikely as the other person was not wearing noisy clothing. Nor was this person sitting a on noisy seat! Or, given that during MWRs the brain is only partially asleep, might MA's eye have actually detected the approaching arm even though MA could not consciously see it? Or was it a brain 'time trick'? It is possible, for instance, that the 'dream door' started to move at the actual moment when the unconscious bit of MA's brain felt the real touch. The sensation of the touch was only then 'played' later in the dream when the 'door' appeared to hit MA. Does the brain play such time tricks in dreams? I don't know but it seems entirely possible. It is well-known that in misperception, the way visual objects are substituted is to 'make sense' of a poorly seen object. So the door may have been used to make sense of the unexpected touch. It is not easy to study dreams using conventional sleep. That's because dreams are typically forgotten quickly when someone is woken from normal sleep. However, with MWRs the brain is only partly asleep and this seems to allow dreams to be remembered more easily and in detail. MA is often easily able to recall bizarre phrases spoken during such MWR episodes (see here), something difficult with ordinary dreams. It occurs to me that MWRs might be a good way of studying how dreams work. And it might emerge that the brain does indeed mess around with the order of events in dreams. Or maybe MWRs can really open the door to precognition. Recently, as I walked into a hotel reception area, it felt eerily like stepping into a time slip. There were around half a dozen people there dressed in clothes from another era. I'm no historian but I would guess at early nineteenth century. The people could have been ghosts, though I doubt it. They were interacting with other people, in contemporary dress, in a way that suggested they were real life people*. I'm sure many apparent ghost sightings are caused by ordinary people who happen to be dressed in historic costumes. There are all sorts of reasons why people might be seen in public spaces dressed in such a way. Examples include historic re-enactments, fancy dress parties, parades and pageants. Sometimes the participants in such events have to travel to them in costume. This is a good example of how a real life person can cause an apparent ghost sighting! In other news, I saw a fairly well-known actor, seen regularly on UK TV, on a train just over one week into the month. I have no doubt about it being famous person, unlike my last 'sighting' (see here). The question I have is whether I can include the record in 'fame month' , which was August. For more on this see here. *This raises an interesting question. Has there ever been a ghost report where a witness observed an apparition interact with a third party, who was not a ghost? I can't think one! It was odd! A TV aerial on top of a two-storey house was rocking quite violently. The thing was, there wasn't a breath of wind. All the leaves in the trees and bushes in the vicinity were completely still. The aerial continued to rock for several minutes, all with still no sign of the slightest breeze in the area. Once it stopped moving, the aerial then remained perfectly still. So what strange force had propelled it? To explain that I need give the full sequence of events. I happened to glance at the aerial just before before seeing it in motion. Then I looked away for a few seconds before looking back to see the aerial moving. 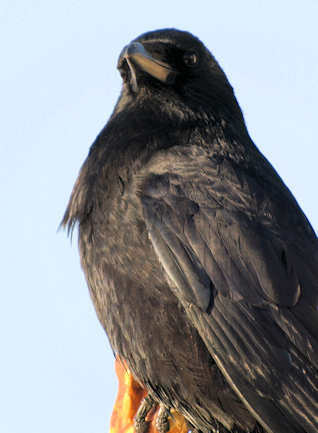 However, in my initial observation I saw a crow on the aerial. In the subsequent view, when the aerial was rocking, the bird had gone. It was clear that the force of the bird taking off had set the aerial rocking. I often say in these blogs that if I hadn't noticed something or other before, or during, a strange incident I would still be puzzling over it now. In this case that is actually what happened! 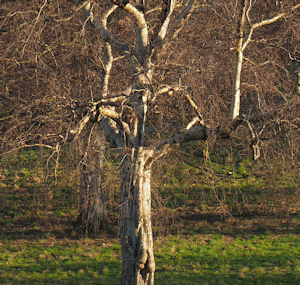 When I first saw the aerial moving I was genuinely puzzled, especially when I saw not a single leaf nearby moving. It was only then that I recalled seeing the crow previously! Though I have a terrible memory I don't think it is to blame for this incident. It was, rather, a failure to connect the crow to moving aerial in my mind, at first. I think that was because I never actually saw the bird take off. And if I hadn't made the connection, I might still be puzzling over the mysterious incident. This illustrates how a witness may have actually seen the cause of an otherwise mysterious incident but not realised it. It shows the value of carefully interviewing witnesses to anomalous incidents. It is worth asking not just about the mysterious occurrence itself but everything else that was going on before and around it. Last month's (August) website figures are an average of 10743 hits per day. This is similar to the previous month's 10619 daily average.